**I received an ARC of this book for free from Netgalley in exchange for my honest review. All opinions that follow are my own and not influenced in any way. My thoughts: This book had good points and bad points hence my 3 star rating. Let’s start with the good: I think for any person, young or not, who has experienced losing a loved one can and will benefit from reading this book. It does paint a heartbreaking, beautiful, accurate picture of grief, how it effects people, and how one can learn to cope with a loss. I felt the characters were all very relatable and real, and I could picture someone I know in my own life who reminded me of each one of these people. All three stories were moving, touching, and had something different to offer when it comes to coping with grief. Now the parts I didn’t care for: I thought the plot was painfully slow. All three character’s stories intertwine at some point but not until 75 percent of the story has been told and the part where they finally do come together, I feel, could have been longer to have more a meaningful impact. Only some of the characters talk to each other about their grief and loss, and I was really hoping that all three would have a heart-to-heart about the losses they experienced…unfortuately that scene never happened. The ending was very abrupt. I did not expect them to be completely over their losses by any means and all three by the end were in a better place with healing, but it ended very suddenly and awkwardly and left me, as the reader, feeling unresolved. I felt more of the story could have been told. I actually thought I wasn’t sent a complete copy and kept searching for one final, wrap up chapter. It desperately needed one to feel like a complete circle had been made. Like I said, I didn’t expect the characters to be completely healed by the end, but I did want more of a resolution to each of their stories. Maybe it was the author’s intention to leave their stories wide open, which I respect the author’s creative choices, however it just left me feeling unsatisfied. As stated above anyone who has experienced the lose of a loved one will find this story very relatable, heart warming, and gut wretchingly honest in places. I do recommend it especially if you love a good contemporary novel. Unfortunately for me, it just moved a little slow for my liking. This book comes out March 6th so keep an eye out for It! Wonderfully written review! 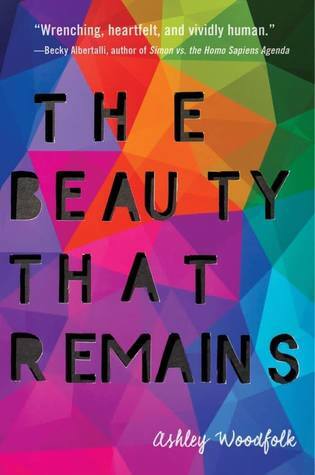 I also read and reviewed an ARC copy of The Beauty that Remains. I totally get what you mean by the slow plot. At some points I felt as though the stories were beginning to repeat themselves with something randomly happening, like Perry making that comment to Dante, which would then trigger the Autumn, Shay, Logan to have a mental breakdown all over again. It did, however feel very real and I liked the alternating points of view. Thanks so much! I agree it felt like the stories were repeating themselves too. I think this book could help a lot of people dealing with grief though despite the things I may not have liked so much 🙂 thanks for commenting!